explores the creative links between contemporary art and a disappearing past mediated through images, texts and objects. 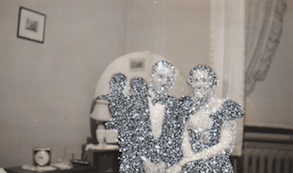 Latour applies flecks of white paint to found photographs taken of individuals as well as groups of friends and families from the early part of the 20th century. The erasure of these anonymous persons points to the gradual fading of all subjects over time. White paint is also used to erase all but a few words taken from the pages of 19th century gothic novels. New stories are created from the words that remain, and the pages are hung in antique frames like ambiguous proverbs from the past. Kindred Spirits also presents two sculptural productions including the ongoing Apports (2010- ) and Time machine 2 (2009). The former is a series of works that incorporates transformed vintage found objects into sculptures that reference the phenomenon of “apportation” – the appearance of small items believed to have been carried over from the other side by visiting spirits during séances. The latter is an antique clock that sits at the entrance of the exhibition. Minute by minute, hour by hour, the hands of this modified clock move in a counter-clockwise direction. As if through some form of wish fulfillment, it invites visitors to travel backwards in time. The combination and juxtaposition of vintage images, fragmentary texts and occult objects in Kindred Spirits is an open invitation for viewers to imagine their own links between the seemingly unconnected photographs, texts and objects in the exhibition. Kindred Spirits is accompanied by a commissioned text by Toronto-based contemporary art curator and author Scott McLeod. Director and curator of Prefix Institute of Contemporary Art, McLeod has also been the editor and publisher of Prefix Photomagazine since 1999. The opening of Kindred Spirits takes place on June 22 (from 2:30 pm to 5:30 pm) and will include the Toronto launch of Rétrofictions (2012). This experimental and collaborative artist’s book juxtaposes six photographic works by Latour alongside as many works of fiction by invited authors Jennifer Allen, Marina Endicott, Cynthia Imogen Hammond, Lea Nakonechny, Eduardo Ralickas and Jean-Éric Riopel. All are welcome. Rétrofictions is distributed in Toronto by Art Metropole and in Montreal by Formats bookstore. 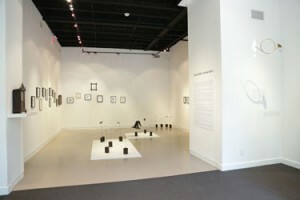 John Latour is a Montreal-based visual artist whose work has been exhibited across Canada and abroad. Solo exhibitions of his art have been held at the Karsh-Masson Gallery (Ottawa), the Galerie Glendon Gallery (Toronto), the MacLaren Art Centre (Barrie) and Pierre-François Ouellette art contemporain (Montreal). Latour has a BFA in Studio (University of Ottawa), a MLIS (McGill University) and a MA in Art History (Concordia University). His work is included in both private and public collections in Canada and the U.S.
Pierre-François Ouellette is pleased to announce the appointment of Vanessa Runions as his gallery liaison in Toronto. Vanessa will be available to welcome visitors on Saturdays from 1 pm to 5 pm for the duration of Kindred Spirits.